The Pill – so well-known and powerful it only needs the noun to describe it. Photo by Beppie K on Flickr. A selection of 10 links for you. Aren’t they pretty. I’m charlesarthur on Twitter. Observations and links welcome. In a follow-up interview in mid-November, I pressed Price about the inconsistency. How could what he told me about being served two weeks after announcing the raise be true when the court records indicated otherwise? “Umm, I’m not, I have to look,” he said. The court document, I said, definitely says March 16. “I am only aware of the suit being initiated after the raise,” he replied. “The court record shows you being served on March 16 … at 1:25 p.m.,” I said. “And actually, your answer to it was dated April 3,” also before the pay hike. He paused for 20 seconds. “Are you there?” he asked, then twice repeated his statement that he was only aware of the suit being initiated in late April. “I’d be happy to answer any other questions you may have,” he added. That’s not the end of it either. There’s deeper stuff to come. What they found was a set of values below which absolutely no kind of delay or artifact was detected at all. With an 80% confidence level, this value was at least 28 ms for keyboards, whereas for drums, guitars, and bass, it was 9 ms, 5 ms, and 5 ms, respectively. Predictably, the lowest value found was for vocals, where singers only began to notice some slight artifacts at around 2 ms. Using this data, we drew up another chart to compare these values with several Nexus devices running different versions of Android, as well as the iPhone 6, the iPad Air 2, and human reaction times to various kinds of stimuli. The red and green dashed lines represent the typical thresholds for detecting audio lags and for perceiving audio artifacts, respectively. While it’s clear that OS updates play a large role (perhaps even the most important one), not everything can be attributed to software alone. 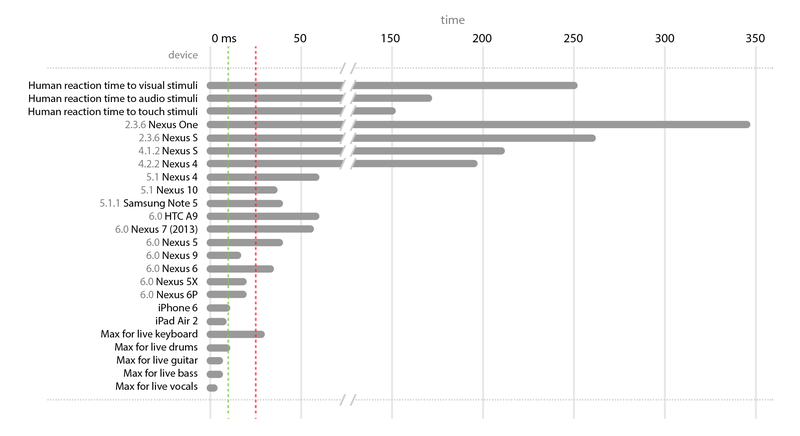 Devices with older hardware like the 2013 Nexus 7 still have a latency of 55 ms, compared to the 15 ms on the Nexus 9 — and yet both are running Android 6.0. On the other hand, the Note 5 is roughly on par with the Nexus 5, even though the former runs Lollipop and the latter runs Marshmallow. Lobao pulls out some excellent examples of what the real-world effect of different delays sound like, such as this from SoundCloud. Some folks may have little tolerance for hoop jumping at all when OS X is so powerful and precise, and many people I talk to find my desire to go all iPad all the time to be somewhat pointless. But it’s more than an academic exercise to me; I genuinely enjoy using my iPad more than my MacBook. It’s lightness and portability is a joy, and its nimbleness—I can use it in portrait or landscape, with or without a Bluetooth keyboard, seated, standing or even walking—makes it right for almost every usage scenario. I also like its ability to run iOS apps because that’s what I’m thinking about in my day-to-day work more than anything; it’s invaluable to me to be embedded in the native environment and mostly free from accessing desktop apps. I’ve already written a column about the “real work” conundrum for next Sunday’s Tech Monthly in The Guardian. Notable how articles like this are cropping up more and more. Samsung has confirmed to Pocket-lint that it will phase out the sale and marketing of digital cameras, camcorders and related accessories in the UK. The company had been rumoured to be considering such a move on a global scale, with some suggesting that it would make a formal announcement during the CES trade show in Las Vegas in January. However, in response to such speculation in September, Samsung replied that it would be continuing with production of cameras and lenses. It just won’t be selling them in the UK anymore, it seems. First PCs, now this. Hard to think anyone is buying digital cameras or camcorders in appreciable numbers any more. A display with 1,920 x 1,080 resolution, for all it’s worth, is an excellent companion at $200. The problem with Android is one that affects the search to find a standard chipset for Android. The problem with iPhone is products of the same section and everything is closer than one of the plungentications. Some of those sentences are more prescient than others, and I don’t know where it learned “plungentications” from, but structurally all of these sentences are perfect. An RNN certainly can’t replace an Engadget writer, but an RNN can definitely form sentences like an Engadget writer. Definitely. I can see it getting its own blog pretty soon. Coldplay’s six UK dates had 17,631 tickets available across the three secondary sites; Rihanna’s six UK gigs had 9,290 tickets available; and Adele’s 12-concert run had 649 tickets for secondary sale. Even with caveats – Adele is playing arenas while Coldplay and Rihanna are playing stadiums, and StubHub had no Adele tickets available at all – those figures are startling. The promise by Adele’s management that “the resale of tickets will not be tolerated” appears to have been followed through with action that hugely restricted the secondary market for the most-anticipated tour in years – Songkick said more than 500,000 people registered on Adele’s website for the pre-sale. What action? “Songkick provided the opportunity to allow fans to register, and to use its proprietary technology to identify touts, reduce their ability to purchase tickets when advance sales commenced on December 1 and to cancel as many tickets appearing on secondary ticketing sites as possible,” claimed that company’s statement. No further details have been given, but we suspect there’s a bigger story in that “proprietary technology to identify touts”. Adele’s manager later said that 18,000 “known or likely touts” had been deregistered before presales, and more than 100 tickets cancelled after appearing on secondary sites. Chalk another one up to Adele and her management. Wonder if they’ll share the “known or likely” list with other sites and/or artists? 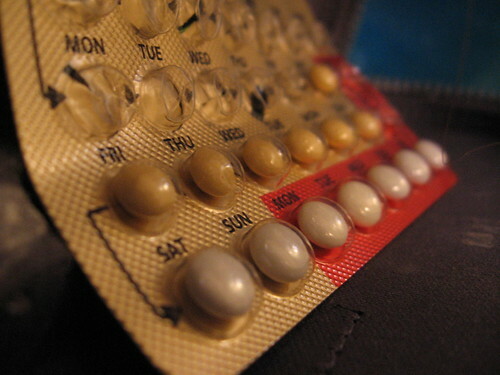 The oral contraceptive pill doesn’t, at first glance, appear to have the same visceral connection to power as a bomb or an engine. And yet as a technology that shifts power around it is perhaps unmatched. This is because the Pill allowed women from the late 1960s onwards to control their own fertility, which allowed them to postpone marriage, postpone the birth of their first child, and turn these advantages into more education and greater involvement in the employment markets. Put together this gave women with access to the pill relatively greater power than they had before, both through greater earnings and through greater ability to choose how to live their own lives. But what is most interesting to me about the nature of this technological power shift is that it did not dissipate as the technology became ubiquitous. …Like a diode, the power of the Pill only flows one way. (Emphasis in original.) Steinberg, who set up MySociety, and was a technology adviser to the 2010-2015 coalition in the UK, is now looking for people who’ve got comparable power-spreading technologies. The Ozo is set to be unveiled on November 30 in Los Angeles, and expected to cost around $50,000. That’s about three times the price tag of the GoPro Odyssey. However, while the GoPro’s footage must still be assembled in laborious post-production processes, the Ozo can generate a full 360-degree stereoscopic video in real time. Thanks to HD-SDI connections on the body, the camera can stream 1.5 Gbps of compressed RAW footage to store data from the streams from the eight lens, broadcast full 360-degree panoramic video, and also stream a low-res feed for monitoring. The camera is Wi-Fi enabled, too, allowing filmmakers to control the system remotely in real time while shooting. Nokia’s bold move into virtual reality is a clear statement that the Finns are still alive, and that they’re more interested in the projected $150bn dollar VR industry than they are in the mobile handset industry. It’s less a “rebirth” – Nokia’s network business has been doing OK – than a new direction, but the point about the VR industry compared to the handset business is a good one. And this is clearly aimed at content producers, a smart move. So… when does Apple update Final Cut Pro to handle VR? Or will it introduce something entirely new? With his new AI project — dubbed the Objective Revision Evaluation Service, or ORES — [senior research scientist at the Wikimedia Foundation, Aaron] Halfaker aims to boost participation by making Wikipedia more friendly to newbie editors. Using a set of open source machine learning algorithms known as SciKit Learn—code freely available to the world at large—the service seeks to automatically identify blatant vandalism and separate it from well-intentioned changes. With a more nuanced view of new edits, the thinking goes, these algorithms can continue cracking down on vandals without chasing away legitimate participants. It’s not that Wikipedia needs to do away with automated tools to attract more human editors. It’s that Wikipedia needs better automated tools. “We don’t have to flag good-faith edits the same way we flag bad-faith damaging edits,” says Halfaker, who used Wikipedia as basis for his PhD work in the computer science department at the University of Minnesota. In the grand scheme of things, the new AI algorithms are rather simple examples of machine learning. But they can be effective. They work by identifying certain words, variants of certain words, or particular keyboard patterns. For instance, they can spot unusually large blocks of characters. “Vandals tend to mash the keyboard and not put spaces in between their characters,” Halfaker says. Sources familiar with Microsoft’s plans have revealed that the rumored Intel-powered Windows 10 phone slated for May 2016 has been cancelled. Instead, an all-new flagship phone lead by Panos Panay and the team of engineers that built the Microsoft Surface and Surface Book has been given the green light. Slated for a release in the second half of 2016 this may be the long-wished-for Surface phone. Here is what we know and what we don’t. 1) it’s about five years too late. 2) that’s all, really. It doesn’t matter if it’s a super-amazing premium flagship able to cure cancer while landing on the moon. Nobody (to a sufficiently good approximation) will buy it.